** Final 2018 Update- Together we raised more than $800 in cash donations and collected more than 150 new, unwrapped toys. Thank you for supporting Toys for Tots! The mission of Toys for Tots is to collect and distribute new, unwrapped toys to children who would not otherwise receive gifts for the holidays. For over 20 years, Toys for Tots has helped less fortunate children in our own communities experience the joy of Christmas. You can help the U.S. Marine Corps Reserve by donating a toy when you visit any of our offices. 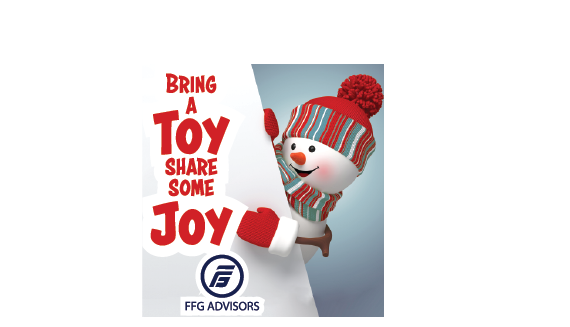 Krysti Robel from our Bethesda, Maryland Headquarters and Maria Salter from our Reston, Virginia office both nominated Toys For Tots for the official 2018 FFG Holiday Charity Drive. Krysti has organized donation efforts in the Bethesda & Reston offices for the past 6 years and also supports their local Toys For Tots Campaign in Frederick, MD annually. Maria Salter has volunteered her personal time helping Toys for Tots with collection and distribution of toys. "My husband is a retired Marine," said Maria, "and we have always remembered what it was like to not be together for Christmas. So we decided many years ago to support this organization that seeks to bring joy to kids who feel alone at a time of year they shouldn’t." Each of our office locations office will collect New, Unwrapped Toys and Cash Donations via Toy Collection Boxes and Cash Donation Boxes, displayed by the Front Desk of each office.